Motorola has produced a smartphone that puts the focus on speech and gesture commands. After months of leaks and rumors, Google-owned Motorola finally unveiled the customizable Moto X smartphone. The sleek new handset was officially shown off at a Motorola press event in New York City. While many of the device’s specs and features were well-known long before today’s announcement, Motorola still managed to surprise many in the tech world with a smartphone that emphasizes a “hands off” approach. First and foremost, today’s event confirmed that the Moto X is by no means a high-end Android handset. It simply doesn’t stack up to the likes of the Samsung Galaxy S4, HTC One, or Sony Xperia Z. Instead, the Moto X positions itself firmly in the mid-range market, evoking nostalgia for the face plate customization craze that Nokia kicked off in the late 1990s. Lately, it seems that phones are growing rather than shrinking. Phablets with oversized screens are taking a major stake in the smartphone market, led by such devices as the 5.5-inch Galaxy Note II and the soon-to-be released 6.4-inch Xperia Z Ultra. The Moto X has a 4.7-inch display – the same size as the HTC One, but slightly smaller than the 5-inch Galaxy S4 and Xperia Z. The Moto X might not have the biggest screen, but it does have one size advantage. Compared to the HTC One, the Moto X manages to shave half an inch of overall height, despite having the exact same display size. As far as resolution is concerned, the 720p Moto X simply cannot compete with the full-HD, 1080p screens found on many of the other Android handsets. It even has fewer pixels per inch (PPI) than the dated iPhone 5. Under the hood is an expectedly mid-range, yet fully capable, chipset. The Moto X opts for a Motorola-customized version of the Qualcomm Snapdragon S4 Pro – dubbed the X8. “This is where the device really falls behind: unlike the other big Android smartphones, Motorola's processor has only two CPU processor cores, while everything else is running on newer, faster quad-core processors,” said The Verge. While less expensive than the other flagships, the Moto X ended up quite a bit more expensive than predicted. Goldman Sachs analysts anticipated a handset that would cost $300 off contract. In reality, the 16GB Moto X will retail for $575. The cost with a two year contract is still $200 – the same price as the much more powerful Galaxy S4 on a similar two-year plan. Motorola may have missed a major opportunity to rack up sales without a $99 on-contract deal. Motorola has also loaded the Moto X with sensors, allowing it to be used hands-free. “The phone’s ‘touchless control’ interface is its biggest innovation. Without switching on the device, simply saying ‘Okay Google Now’ followed by a command can make a phone place a call, get directions, perform a Google search, or more. The phone’s accelerometer can also tell whether you’re in a moving car and tailor its commands and notifications accordingly,” explained MIT Technology Review. To preserve the phone’s precious battery life, Motorola’s X8 CPU has two additional processors that handle voice commands and “contextual computing” – the phone’s sensors. Simply turn the phone so it’s facing up, and notifications will begin to appear on the home screen. If you flick your wrist while gripping the Moto X, the 10MP camera will launch. 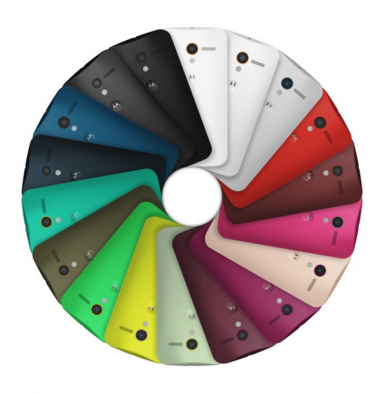 The Moto X will be offered in a variety of colors and textures – 18 back colors and seven accent colors, to be exact – in addition to wood grain. Custom-ordered handsets are assembled in the U.S. and shipped within four days. This is major breakthrough for consumers looking for a smartphone that isn’t black, white, or silver. At present, only American customers will be able to order a Moto X. It will become available at the end of this month or early September, depending on carrier. Motorola hinted that a “Google Play” edition could arrive at some point in the future.